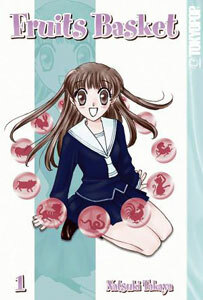 First published in Hana To Yume (花とゆめ), Fruits Basket, more commonly called "Furuba" (FURUtsu BAsuketto) for short, is the most well-known series of mangaka Natsuki Takaya. Being one of the most well-loved shoujo series ever, the manga ran until the end of 2006, totaling 23 volumes, and was also adapted into a 26-episode anime. Fruits Basket tells the story of young high school student Tohru Honda. Recently orphaned and with few places to go, she's unwilling to place burden on her grandfather during his home remodeling, so she decides to temporarily take up residence in a tent in a seemingly abandoned forest. Little does she know that she's staying on land owned by the Sohma family - one of whom attends her high school: Yuki Sohma, resident Prince Charming and heartthrob of the female population, though very mysterious and close to no one. Yuki and his older cousin, Shigure, live in a house on that piece of land, and it's not long before they go for a walk and discover Tohru's makeshift residence. Unwilling to let Tohru stay outside, they invite her to stay with them in a spare room until her grandfather's house is in order, and she agrees - though quite reluctantly, agreeing to do their housework in exchange. In her first few days of staying with Yuki and Shigure, she has a very abrupt introduction to another member of the family - Kyo, armed with a temper that matches his (~flaming~) orange hair, breaks into the roof of the house and challenges Yuki to a fight. In a moment of sheer panic at the idea, she accidentally grabs Kyo and turns to apologize, only to find that there is no Kyo and only a cat. In the next few seconds she manages to freak out and transform both Yuki and Shigure into a rat and dog, respectively. As they turn back into humans, they explain to her that the Sohma family is cursed with the thirteen spirits of the Chinese zodiac: rat, ox, tiger, rabbit, dragon (seahorse), snake, horse, sheep, monkey, rooster, dog, pig, and cat. When embraced by someone of the opposite gender or put under extreme stress, they turn into their animal spirits, and return to their human forms after a while (though completely naked). Tohru realizes that this is why Yuki isn't close to anyone at school, though he certainly isn't lacking attention from girls (or boys, for that matter) - he can't risk exposing his secret to anyone. Through some odd twist of fate, Tohru is allowed to stay with Yuki, Kyo, and Shigure for the entire duration of her high school career even though she knows their secret. In these years, she comes to love the Sohmas, though she learns the mysterious and dark truths behind their family history as a result of the curse. Fruits Basket is truly a classic shoujo manga series - I was late to the fandom, myself, but I discovered it in middle school and have been in love ever since. It's a beautiful tale of friendship and love, though not without a fair dollop of angst and certainly not without humor. If you don't know it, get on it!